The start of a new year is a good time to have a look at all the forecasts for food trends in 2018. With our first couple of lab jams @TOPbv already planned for 2018, a bit of inspiration can do no harm. The first and most important trend is the continuing growth and importance of plant based foods. Driven by the trend for ‘mindfulness’, which includes social consciousness, environmental awareness, health and wellness, this trend has soared in 2017 and in my opinion will continue to do so for the next few years. To incorporate more vegetables and plant-based meat replacers in our daily diet has almost become mainstream. But there are still a lot of challenges ahead for the food technologist. For 2018 our focus as food innovators and technologists will be to improve the variety and the quality of products available to the consumer. I hope that 2018 will be the year that we will move away from imitation meat products into new experiences based on vegetables and plant protein to include in our daily diet. The drive for more plant based foods has started the new trend of root-to-stem use; not only to reduce food waste but certainly to use all the healthy parts of a plant, since peels and roots often contain high amounts of fiber, bioactive components, minerals and vitamins. At TOP we have a long experience in creating value from plant side streams, whether it’s using fermentation to create interesting new foods (food-to-food) or extraction of the valuable (bioactive) components. Topics we will continue to work on in 2018. For me the next most important trend is the general trend for individualization and experience. As consumers we are constantly looking for new experiences, multisensory factors are becoming more important in food design. It’s not just about flavor and texture but also about visual appearance, sound and even feel of a product. 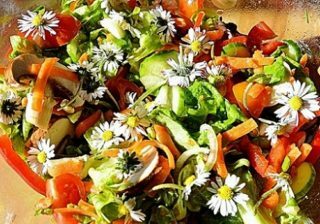 On flavors the foremost forecast is edible flowers, flowers are used both as a taste, lots of lavender, as well as a used as an ingredient in for example salads. On foods for 2018 we see predictions for products such as cheese tea, rainbow foods, seaweed burgers, sushi variations and mocktails. Of course all these are beautiful food products that are very suitable to be placed on your social media accounts. But whatever trend you follow and whatever products you dream of, whether it’s vegetable based menu items, root-to-stem or plant protein foods – we at TOP are looking forward to developing and designing both the foods and the new processing lines to create them.